Meanwhile, the disciples were urging Jesus, "Rabbi, eat something." But Jesus replied, "I have a kind of food you know nothing about." "Did someone bring him food while we were gone?" the disciples asked each other. Jesus had real food, food that sustained his soul rather than his body. 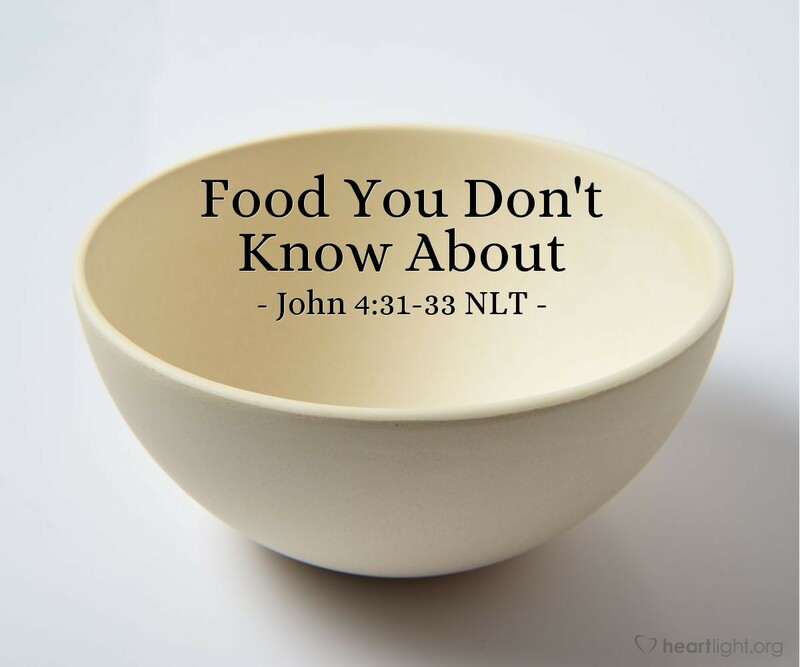 While physical food was greatly valued by Jesus and his disciples (John 4:8; 6:1-14), we must always remember that Jesus was trying to open our eyes so we can see the real food God longs to provide us. The same power that sustained Jesus — living out God's mission in our lives — can sustain us. Let's find that food! Open my eyes, dear Lord, and help me see what is important. Turn my heart to your will, your Word, and your Spirit for I know that only these can truly nourish me and sustain me. In Jesus' name, I pray. Amen.